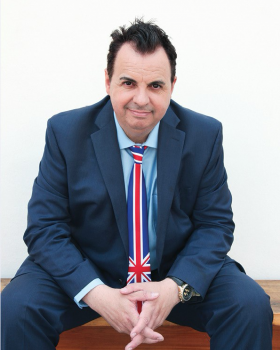 Sandro has written, directed, produced and performed in a string of stage shows around the world from London's West End, Off Broadway in New York and the Edinburgh Festival to his home city of Los Angeles. These include his play MARILYN AND SINATRA, parody musical MISERABLE LESBIANS, his autobiographical one man show, CLOONEY, COWELL, PITT AND ME and his revival of the comedy AN EVENING WITH GARY LINEKAR. He also hosted An Evening with Sylvester Stallone at England's giant Manchester Arena. Now Sandro is writing for film and TV, with his specialty being untold stories about showbiz icons. He is also a Hollywood expert and commentator, frequently seen on CNN and BBC TV, and host of award shows and conferences. A true Tinseltown insider, he is the man the stars talk to as the host of A-list interview events on stages around the world with Hollywood's biggest superstars. Sandro teaches interview technique and created the world's first Bachelor of Arts University course in Celebrity Journalism. Another creation of his is the number one rated Hollywood Tour on Trip Advisor, the Celebrity Insider Movie Locations Tour of LA. The short films he has written and directed are the comedies LADY BOY, MANCHESTER BY THE CANAL, BRITISH HUSTLE, SPOTLITE; THE FARCE AWAKENS and multi-award winner MISERABLE LESBIANS. Additionally, he is a trained magician and an advocate for the UN who sits on the board of his local chapter of the United Nations.